PARIS, Nov 18, 2013/ — To highlight the creative spirit of Antwerp, The Antwerp World Diamond Centre and the Flanders Fashion Institute have joined forces with Diarough/UNI-Design, a leading Antwerp diamond company and A.F.Vandevorst, the internationally respected Antwerp based fashion house. A.F.Vandevorst has designed a pair of boots incorporating diamonds from Diarough for Business Of Design Week in Hong Kong (December 2nd – 7th, 2013), which this year has a special focus on Belgium and its creative industries. The idea was set up by Flanders Investment and Trade (FIT), the Flemish Government agency charged with promoting international business in Flanders and abroad. The Belgian hosted Business of Design Week provides a unique opportunity to highlight some of Flanders’ most world famed industries and products. 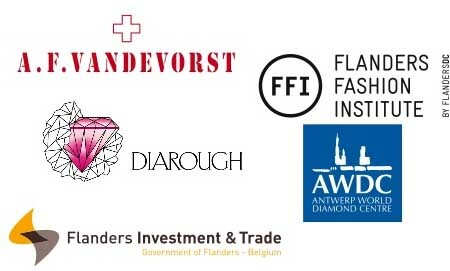 The choice of A.F.Vandevorst and Diarough, both acknowledged leaders in their respected fields, combines two of Antwerp’s most globally respected creative industries, fashion and diamond manufacturing. The high value boots, designed by A.F.Vandevorst and manufactured by Diarough/UNI-Design, illustrates Antwerp’s renown as a world creative capital. The unique pair of boots will be revealed during a high profile event as part of Business Of Design Week in Hong Kong, which will be attended by the leading members of the international design and media communities.